Posted: Thursday, October 13, 2016. 6:43 pm CST. By Richard Harrison: Today is the 8th day of the BNTU strike action to STAND FOR BELIZE, demanding actions by the Government of Belize to curb corruption and to deliver good governance. This strike can be expected to have a similar effect on the economy as the school’s summer vacations from June-August, which is the period of lowest trade for most sectors of the economy. If the salaries of teachers are not paid for these strike days, 6,000 of them earning an average of $50 per day, the teachers will have invested $2.4 million in salaries that they will not collect….the Government will be saving this amount, by not having to pay it out. Of around 90,000 students, if 45,000 pay an average of $3 per day in transportation costs, the total loss of revenue to the transportation sector will be $1,080,000. If 60,000 students spend an average of $3 per day on food, the total loss to the food sector will be $1,440,000. If 50,000 students spend an average of $2 per day on miscellaneous goods and services, the total loss of revenue to the providers will be $800,000. This total would be $5.72 million. Using a conservative multiplier of 8, this would mean that $45.76 million of trade has been lost in the economy during these 8 days of strike….assuming that each dollar in the economy changes hands 8 times per day. This means that the government can look forward to collecting around $11.44 million less in taxes due to this loss of trade. Hence, the 8 days of the strike will earn the government $11.44 million less in revenues, but its reduction in spending will only be $2.4 million…..thus the total loss to government will be $9.04 million. Most of the statutory bodies, or “government outside the government”, as well as the utility services providers, will be affected in similar ways. Of course, the reality is a little more complex than this….for example, traders could use this opportunity to under-report their volume of trade by much more than they usually do, given “reasonable cause”….so the loss to government can end up being much higher. 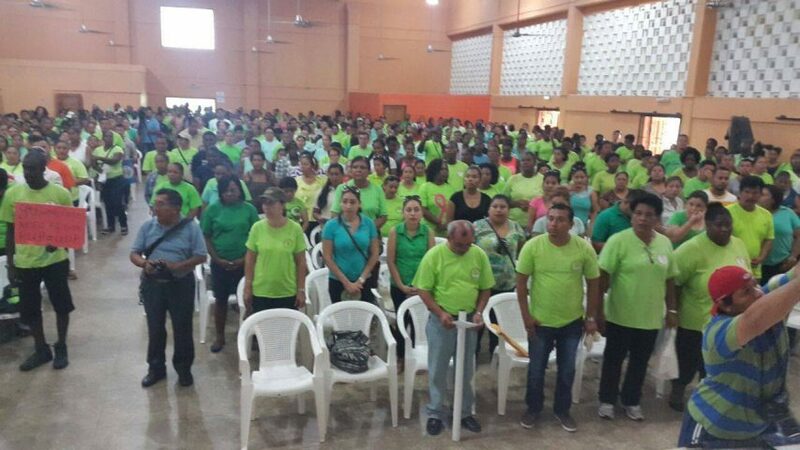 The Government of Belize is not in the position where it can afford to be losing this kind of revenue….thus the strike is hurting them a lot more than would at first appear. The Prime Minister has better honor the teacher’s just demands….otherwise, if the teachers are forced to continue to strike, he might have to draw down some foreign reserves to pay the members of the Public Service Union at the end of October. These members would be the wiser if they joined the teachers NOW to force the government to yield earlier, and cause less pain on everyone. I AM WITH THE TEACHERS, I DEMAND GOOD GOEVRNANCE, I WILL NOT….I WILL NOT BUY ANOTHER SOFT DRINK LIKE COKE, FANTA, ETC. ETC , NO BEER, NONE AT ALL UNTIL BARROW COMES CLEAN !!! WE ALL NEED TO PUT PRESSURE, WE ALL NEED TO BE ONE HEAD, ONE DECISION, GIVE THEM NO BUSINESS, LET THEM FEEL THE PINCH !!! I will drink fruit juices, I will eat a hard tortilla at home, no business for restuarants,I not even go to Melchor, let Barrow spend , not me !